Kens collection was absolutely professional ! 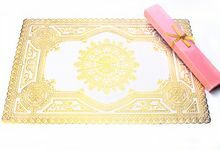 pak Tonny who helped us in designing the card was superbly patient, kind and considerate while he was helping us, I would recommend kens collection to anyone who needs cards made…best wishes always !! Very good service. Very easy to communicate with designer & work with him. Very efficient and fast. Appreciate the speed in order and doing all our design change & comments. Great job !!! Blown away with the design. Looks very expensive and yet worth every penny. Price is really affordable as well. The service here is quick excellent and very friendly service. Pelayanan ramah dan sabar, harga ekonomis, selesai tepat waktu, pekerjaan rapi, hasil undangan memuaskan , dan pastinya marketing Bu Lusi super baik dan sabar. Maju terus untuk Ken’s !!! 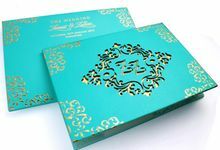 Pada saat awal order dan melakukan DP di pameran pernikahan, marketingnya juga harus bagus dalam melayani orderan kami. Chat via whatsapp juga sangat cepat dibalas. Dan Team dari Kens Collections sangat komunikatif dan ramah. 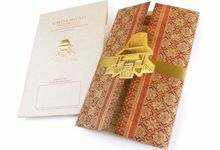 Saat proses layout sampai ke proses cetak juga sangat cepat dan saat saya ambil hasil undangannya, hasilnya sangat rapi, bagus dan sangat memuaskan. Terima kasih Kens Collections. 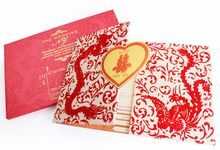 We, at Ken’s Collections, specialize in the manufacturing of the most exquisite wedding cards. 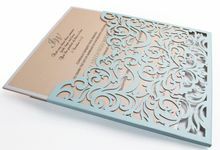 With thousands of designs available to choose from, you will never run out of ideas. 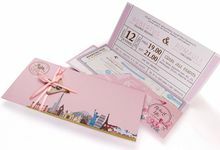 Customised cards with your very own creative ideas are also welcome. 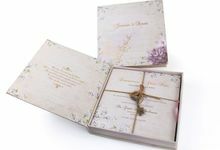 Our cards come in full range from Soft Cover, Hard Cover, Box Model, Scroll Model and many more. 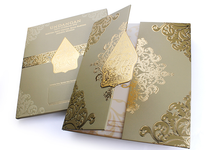 We can customize any card to your requirements or you can sit one-to-one with our designer and create your own design. 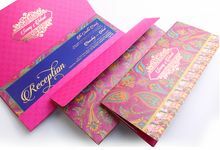 1 week to 2 months depending upon card design and accesories used. Our exclusive and spacious one-stop-studio also allows us to take EXPRESS ORDERS. 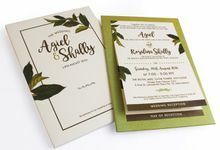 Thanks to our experienced designers and marketing executives who will guide you through each and every step making the order process very simple. 3 months in advance would be ideal. 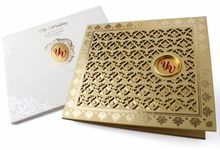 Huge Variety We, at Ken’s Collections, specialize in the manufacturing of the most exquisite wedding cards. 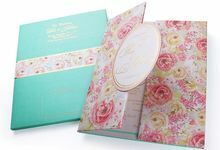 With thousands of designs available to choose from, you will never run out of ideas. 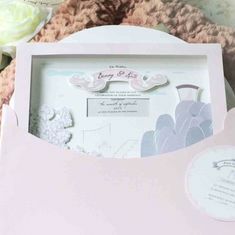 Customised cards with your very own creative ideas are also welcome. 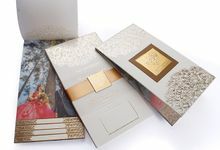 Our cards come in full range from Soft Cover, Hard Cover, Box Model, Scroll Model and many more. 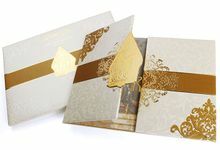 We can customize any card to your requirements or you can sit one-to-one with our designer and create your own design. 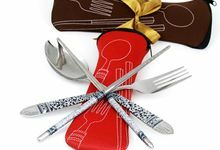 Competitive Prices and High Quality Standards The entire production and manufacturing process starting from designing aspects to the final finishing are all done under one roof with sophisticated facilities. Hence we are able to give you very competitive prices while maintaining a high quality standard. 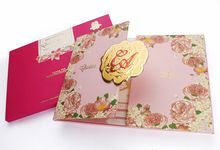 Express / Rush Orders Our exclusive and spacious one-stop-studio also allows us to take EXPRESS ORDERS. 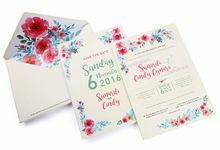 Thanks to our experienced designers and marketing executives who will guide you through each and every step making the order process very simple. International Experience We have worked with clients from all around the world and have staff proficient in many different languages. 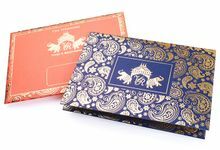 We can even send our representative with samples to your country. 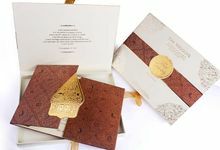 Complete Wedding Stationery The great news is we don’t just manufacture wedding cards but also other wedding stationeries such as RSVP cards, Thank You Cards, Pre-invites, Paper Bags, Wedding Booklets, Boxes, Stickers, etc. Easy Communication In a world as advanced as today, we have cutting edge technology that eases your way into efficient and effective communication with us. We can happily conduct Skype meetings if you cannot find the time for a face-to-face meeting. Over 15 Years of Experience With a vast experience of over 15 years, you can be rest assured that your needs and wants are our priority and we consistently look into the improvement of our services for your satisfaction. Moreover, any kind of suggestions or feedback is always appreciated and welcomed. 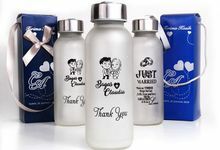 Wedding Souvenirs We also offer a wide variety of wedding souvenirs and we can pack them according to the colours of your wedding card or your wedding event. 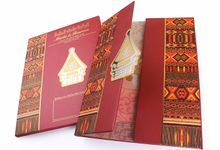 We believe that the presentation and packaging of the souvenirs should have a unique and appealing effect to make it unforgettable. 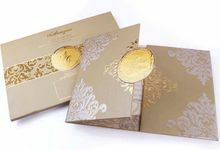 Cards for Other Occasions We do not only design and manufacture Wedding Cards but also cards for other occasions such as Anniversaries, Birthday Parties, Sweet 17 Birthdays, House Warming, Grand Opening, Circumcision Ceremony, Season’s Greetings, etc. We are open seven days a week including public holidays. 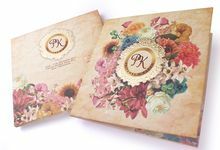 Come to Ken’s Collections and we will make sure that we will make a wedding invitation that’s just as special as you are. Fiifty percent of the full payment is paid upon order confirmation and the balance along with the courier charges where applicable is paid once cards are ready. With a vast experience of over 15 years, you can be rest assured that your needs and wants are our priority and we consistently look into the improvement of our services for your satisfaction. Moreover, any kind of suggestions or feedback is always appreciated and welcomed. A wedding is one of the most important event and milestone in a person’s life. 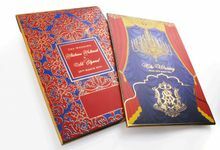 Having found the special life partner, every couple dreams of the perfect wedding. 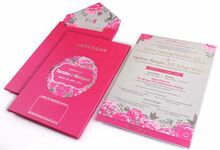 At Ken’s Collections we understand how special this occasion is and we ensure you that with the help of our team of designers we will provide you with an invitation just as special as you are.